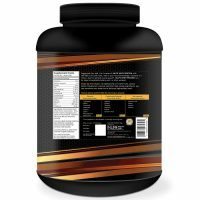 Product Name: Muscleblaze Whey Premium Rich Milk Chocolate. Pack Size: This pack contains 1 kg| 2kg powder. MuscleBlaze Whey Premium Rich Milk Chocolate sets a new definition of fitness nutrition as it is loaded with 26g of fast absorbing proteins derived from Whey Protein Isolate and Whey Protein Concentrate. 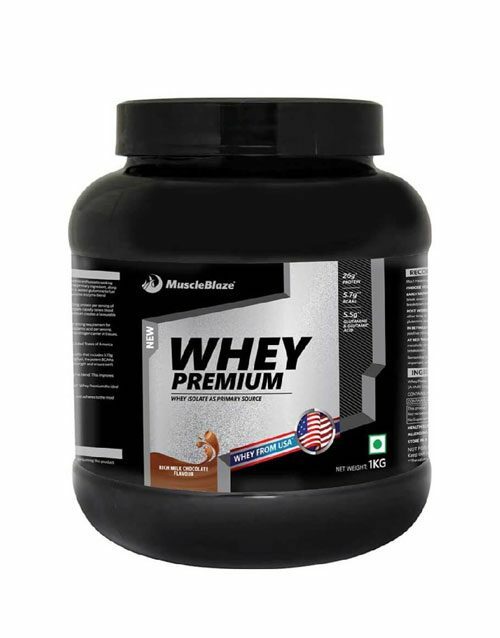 The Whey being imported from United States of America makes its protein content truly international grade. With 1g of added glutamine per serving, MuscleBlaze Whey Premium Rich Milk Chocolate is the best in class recovery protein for fitness enthusiasts. Each serving (34.5g) of MuscleBlaze Whey Premium Rich Milk Chocolate provides 26g of fast absorbing protein that kickstarts the release of amino acids into the bloodstream and providing quick recovery post intense workout. The consumption of MuscleBlaze Whey Premium creates a favorable anabolic state in the body to boost the synthesis of lean muscle mass. Enriched with BCAA(s) and EAA(s): With intricate profile of amino acids used in developing MuscleBlaze Whey Premium, this protein supplement includes 5.73g of BCAA(s) and 12.23g of EAA(s). The availability of BCAA Leucine, Isoleucine, and Valine in MuscleBlaze Whey Premium provide strength to perform heavy workouts, reduce fatigue, and enhance muscular strength. With added Glutamine: MuscleBlaze Whey Premium contains 5.55g of Glutamine and Glutamic acid per serving which aids in transporting nitrogen to the muscles to aid faster muscle recovery process and muscle synthesis. It prevents the body from going into the catabolic state during inactivity and thus leads to faster muscle recovery. With goodness of DigeZyme: MuscleBlaze Whey Premium comes with added DigeZyme, a blend of 5 digestive enzymes to support faster protein digestion and reducing the symptoms of bloating. Improved digestion boosts the maximum absorption of proteins in the muscles and helps achieve lean muscle gain. 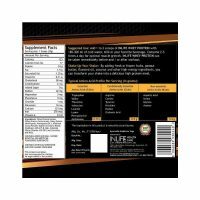 Superior Sweetener Blend:The best in class sweetener mix helps minimize calorie load safely and adheres to the most stringent of standards. This blend has Zero Added Sugar & Zero Aspartame. 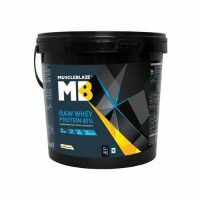 Serving Suggestion: Mix 1 heaping scoop (34.5g) of MuscleBlaze Whey Premium Rich Milk Chocolate in 180-240ml water and shake for 15-20 seconds. For best results, consume MuscleBlaze Whey Premium Rich Milk Chocolate twice a day.